George Bush Intercontinental Airport is one of the world’s top ten busiest airports in terms of how many people pass through its terminals each year. Book your reservations for downtown Houston and take rides in airport shuttle vans such as shared ride shuttles and taxi cabs. You can also get meet and greet service from a personal driver for sedans and limousine from any location so you can easily get to and from IAH airport. Making sure to take care of details like airport transfers will help to make your vacation or business trip as stress free as possible. There are many ways to travel to and from the airport. One of the most popular ways is shared ride van which offer discounted rates by sharing the van with other passengers who are on a similar route as you. Another popular way is by private sedan or limousine services through local providers such as ExecuCar by Super Shuttle and Blacklane. Houston Intercontinental Airport is home to SuperShuttle Blue Van service and that is good news for you. You can grab a ride on one of their shared ride vans or arrange a private ride in a professionally driven town car. GO Airport Shuttle offers a competitively priced IAH airport transfer service that will be easy and reliable for your next trip. IAH airport offers no shortage of airport shuttle service options. Shared ride van providers offer you an economical option to get to and from the airport. While you share your ride with other passengers you can save the cost of the trip because the shuttle bus is traveling in a route that is close to the destination of others in the same van. IAH is Texas's second biggest airport which over thousands of acres and services millions of passengers. This is why pickup and drop off is important, as passengers arriving can easily get lost in the shuffle. When your plane arrives at IAH airport simply go to the south side of your terminal. 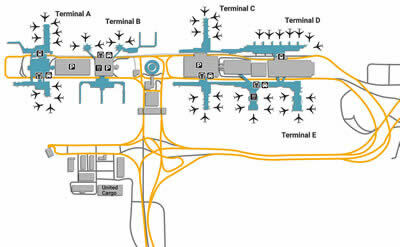 You can also find directions and information about your ground transportation inside each terminal also. Pick up for passengers taking a shared ride van you booked at George Bush Intercontinental Airport can easily be found in the terminal you landed at. Transporting tourists and business travelers up to 12 per group in private vans can take you even as far as the beaches in Galveston. There are hundreds of hotels and motels near downtown Houston so making a reservation with a reputable shuttle provider servicing private sedans can help you start your visit right. After you finish with baggage claim you can head to the end of the terminal to catch your pre-booked ride with friendly drivers who know the city well. Getting to your hotel near Deer Park and Fondren in luxury is best with a private SUV's, which can have up to 6 passengers. Local cab drives to nearby locations such as Arcola, Manvel as well as Galena Park can be cheaper than most airport rides and quicker to access. Some of the best and affordable stretch limo services in Houston can be booked to reassure that you have a licensed chauffeured driver who can transport you around town. If are coming to town with a big group and need to have a drop off in Channelview or any of the surrounding cities of Houston then a bus may be a great option. Get through the various locations of the airport and shuttle locations when you land at the airport. SuperShuttle Houston provides shared ride services from IAH airport, also known as George Bush Intercontinental Airport to downtown Houston and surrounding communities. Shuttles rides are available to Port of Galveston, the Astrodome and downtown Houston. A local provider in the area, FlitWays has private SUV’s available so you can get direct routes to the airport with plenty of room for your luggage. The local Houston hotel shuttle providers and motels to and from the airport provide courtesy vans. IAH is also located close to downtown Houston that is good reason an airport shuttle service is important for travelers to the city. The majority of shuttle services are available in the terminals. Once you book your shuttle, private van or sedan make sure to check in with the transportation company to verify where your pickup location is. 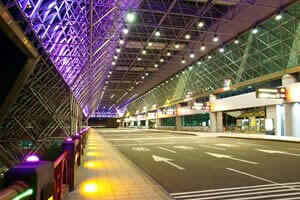 Search for airport transfers for Houston hotel shuttles and save on your airport ride today. Groups traveling into the city who are looking for rides to George R. Brown Convention Center can find rates that can be combined into one shuttle bus that can fit their group’s budget. If you are a college student who needs consistent rides to the airport during breaks and attend the Texas A&M University and University of Houston you can find discount rates for shuttle services with us. As the name implies, you simply share a van with other passengers who are going to or from the airport. If you are more interested in getting directly to and from your destination a private town car or limousine might be a better option for you. Park, Sleep and Fly services are available at many of the hotels and motels in the surrounding area. Taxis are also available along with pre-scheduled limo pickups and with shuttles to various parking garages on the grounds. Numerous car rental agencies are available when you reach the ground floors of the terminals. A Metro transit bus line picks up passengers outside terminal C and can drop them off to a public station where they can take a bus to a local or long distant destination of their choice. There are many hotels and motels that have a shuttle that runs to and from the airport which can be reserved online from our various shuttle providers. You can arrange for airport transportation by booking your reservation before you travel so you can be reassured to board your ride quickly. Houston is a great city that you’re going to have to experience for yourself so get your hotel reservation set and buy that plane ticket to this amazing city and find hotel shuttle rides for taxicabs and private sedans including the most popular transfer for arriving travelers for shared ride vans in Houston at discount rates. As you arrive you can find useful brochures for traveling through the Houston area for attractions and family events. When you land at the George Bush Intercontinental Airport you truly see why it is listed as the second biggest airport in Texas. Located within the city limits near many Houston surrounding neighborhoods the airport has a train that travels above and under the airport that makes it easier for passengers to get to board their planes. As you enter IAH airport you will notice an Astronaut Statue, which is holding the flag of Texas. It is a simple reminder to travelers of the great history that NASA gave to our country, which came out of Houston. When traveling to the Houston area you can find an abundance of activities for the entire family as well as endless entertainment. When traveling at the airport it pays to be prepared. Here are some good ideas that may help you prepare for your trip.